Take the chili, perhaps the single most distinctive ingredient in Thai cooking. This pungent spice was unknown outside the Americas until Columbus made his voyage to the New World towards the end of the 15th century. Ironically, he was searching for black pepper, then a commodity as valuable as gold dust. 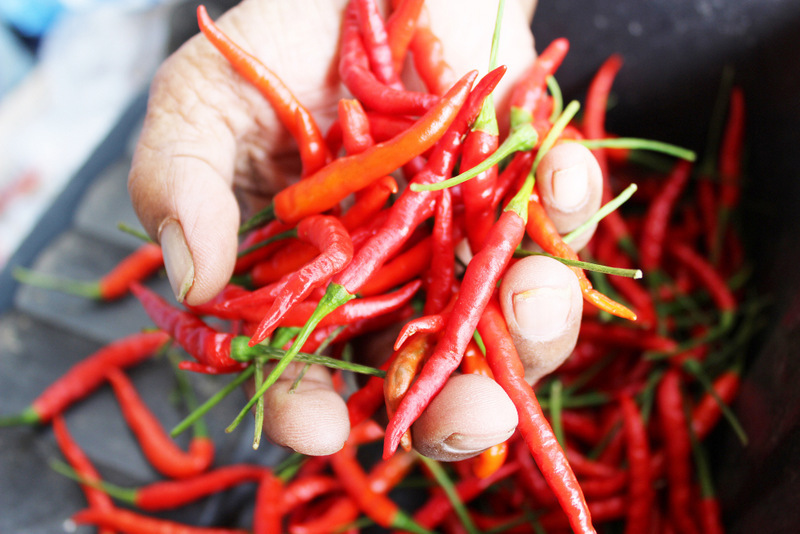 Chilis and peppers probably came to Thailand’s dinner tables much later. One wonders how the cuisine managed without nam prik for so long. The migration of plants has been going on for eons. The Romans brought plums, walnuts, parsley and even roses to foggy Albion; later potatoes, pineapples and tomatoes arrived in northern Europe from America. But the 19th century was the great age of plant collectors; numerous expeditions were mounted with the primary purpose of “discovering” new species and bringing these exotics to the attention of a “civilized” world. The development of the glasshouse and – aptly named “conservatory” – meant that these exotica could literally be “conserved”, indeed might even flourish, in man-made micro-climates that sought to accurately reflect conditions in the wild. Kew Gardens in London, which still houses the largest botanical collection in the world, was founded in 1840 and is a palpable expression of a Victorian explosion of interest in plant hunting. Why, one might justifiably inquire? Britain was of course enjoying its imperialist moment, the greatest nation in the world with a empire where, it was boasted, the sun never set. How better to demonstrate this tentacular reach than to display fruits and flowers from these remote lands. A period of plant-hunting fever, this frenzy spawned both famous collectors and collections. And the motives were not always political or even commercial, but the product of a passion for botany and natural history. George Forrest, for example, was not only the greatest collector and cataloguer of rhododendrons – mostly from China – but also of Camellia saluensis, a species now grown in temperate gardens everywhere. On the other hand, Scottish botanist Robert Fortune, who introduced the Chinese tea plant to northern India in 1848, was attracted by the commercial potential of a beverage nowadays enjoyed the world over. An employee of the East India Company, he somehow managed to smuggle 20,000 seedlings into Darjeeling. It triggered the birth of the Indian tea industry. But he was not just a mercenary. Many other plants are named after him including a euonymus and a mahonia, Hosta fortunei and a celebrated climbing white rose. But the most famous plant heist , and everywhere visible in Thailand, was that engineered by Sir Henry Wickham, who in 1876 stole a huge quantity of rubber tree seeds from their native habitat in Brazil and personally accompanied the cache to London’s Kew Gardens. Subsequently, the seeds were dispatched to a number of British colonies including what was then Malaya. Still regarded in Brazil as a “bio-pirate”, his efforts bore substantial fruit in Malaya and subsequently in Southern Thailand, aided by the manic efforts of one “Rubber Ridley”, and the development of more efficient production methods. To this day, and despite the competition from synthetic rubber and plastic, these South East Asian countries remain pre-eminent producers. 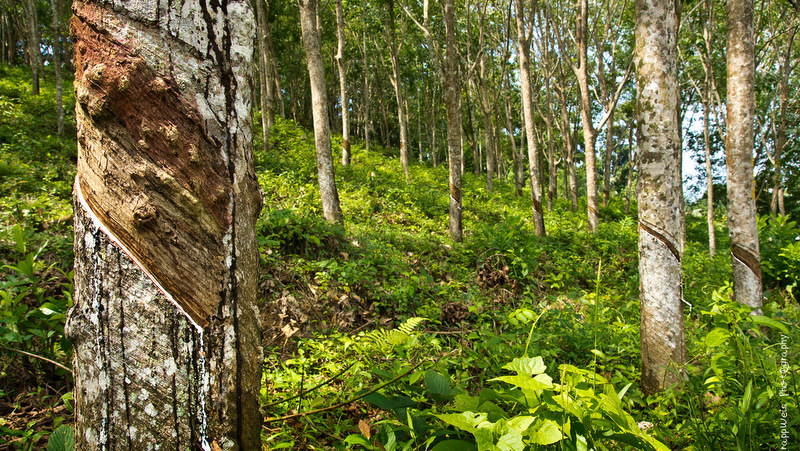 It is no coincidence that here in Phuket 60% of the woodland consists of plantations of Havea Braziliensis. By a strange irony, most of these young para rubber saplings grow alongside rows of pineapples. Ananus comosus had also found its way into Thailand, if more circuitously, from the New World. Evidence of this great botanical migration is all around us. Canna lilies, bougainvilleas, heliconias, acacias, ixoras, and allamanda, are just a few of the flowering shrubs visible from my window – all of them imports from other parts of the globe. Foreign plants, some as yet without local names, continue to appear in garden centres on the island. So is this all good news? Well, for the most part it is. Indeed, some immigrants fare better in their new surroundings than in their original environment. But that is in itself a double-edged sword. Some do so well that they become invasive, supplant local varieties and require culling. Of course the lime-light hugging stories concern invading animals: in Florida’s watery wilderness known as the Everglades, there are now so many Burmese pythons – cast-off pets or escapees – that the entire local fauna is threatened. Australia now plays host to 56 invasive animals including the rabbit and the cane toad, consciously introduced from South America in an attempt to control infestations of beetles in the sugar cane fields. The toad did nothing to eliminate the offending insects, but killed off most or the country’s smaller predators. Closer to home, the most serious importee is the hispine beetle which arrived accidentally in Thailand from Indonesia. Its larvae are steadily munching their way through groves of coconut palms. The list of “take-over” plants is less spectacular. Here in Thailand, gardeners know of the existence of the giant sensitive plant (Mimosa pigra) or the Siam weed (Chromolaena odorata). But in general they approve of wedelia, a small ground-hugging plant that quickly colonizes waste lots, and produces attractive star-shaped flowers. It has the happy knack of surviving where grass will not. Or lantana, considered a pest in Australia, but here treated as a decorative perennial and frequently displayed in nurseries as a multi-hued hybrid suitable for containers. In Phuket, I would point the accusatory finger at only one plant – the water hyacinth, or Eichoria crassipes. Originally from the Amazon basin, where presumably it was eaten by other animals, it has become a pernicious presence in Thailand. Near my house is a large lake now so carpeted by the floating weed that the water is no longer visible. It not only clogs canals and impedes boats but offers a prime habitat for mosquitoes, and worse still, kills fish by depriving them of life-giving oxygen, Its fibres have commercial applications: these need to be urgently exploited. But lets’ not leave on a downbeat note. As far as garden plants are concerned the migratory process, man-made or accidental – has been almost entirely beneficial. All our gardens, everywhere, would be the poorer without these invaders who have come to stay. Patrick has been writing for 10 years about gardening in Phuket and allied topics. If you have horticultural or environmental concerns, please contact him at drpaccampbelll@gmail.com. Many of his earlier creative and academic publications can be found at Wordpress: Green Galoshes.